Home > RA Treatment: What is the Safest Treatment for Rheumatoid Arthritis? > RA and Methotrexate: Does Methotrexate Reduce Inflammation? RA and Methotrexate: Does Methotrexate Reduce Inflammation? Jump to: RA Treatment Methotrexate’s History Possible Side Effects Folic Acid & Methotrexate Dosing Is Methotrexate for You? 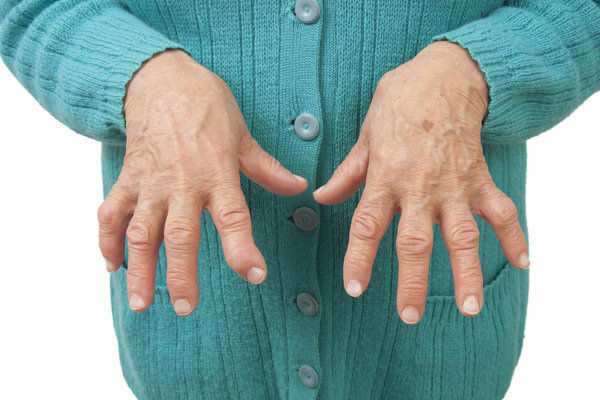 If you have rheumatoid arthritis (RA), you’re probably very familiar with the pain and joint swelling that this particular type of arthritis can cause. If you’ve had it for some time, you may even be experiencing the joint deformities that can occur as RA progresses. As you know, any joint deformity can take a significant toll on your joint function as well as your overall quality of life. RA usually attacks the joints of the hands and feet first, which means even simple activities like tying a shoe, brushing your teeth, combing your hair, or getting dressed in the morning can become painful enterprises. Leisurely pursuits like gardening or taking long walks may have lost their appeal as well, largely as a result of the pain and inflammation these joint-based movements can trigger. Although there is currently no cure for RA, there are medications that a doctor can prescribe to slow the progression of joint destruction and deterioration. One of the most popular and also most effective of these is a folate analog called methotrexate (MTX). It’s a treatment option with one of the longest and most well-established safety profiles of any rheumatoid arthritis drug on the market. RA is an autoimmune disease, which means that it is caused by an abnormal immune response. What does this mean? In a healthy immune system, special cells seek out and destroy harmful germs to prevent infection and disease. But in an autoimmune disease, those same cells attack healthy tissue instead, destroying it (and your health) in the process. In RA specifically, immune cells attack the tissues inside the joints. Normally, these tissues are there to help the joints function properly and to protect the joint surfaces from painful and destructive friction. That’s why RA has the clinical manifestations it does when these joint tissues are damaged or destroyed. Disease-modifying antirheumatic drugs (DMARDs) like methotrexate (generic name: methotrexate sodium) work by targeting the abnormal immune response that causes joint tissue destruction. Among the DMARDs, methotrexate is the one treatment drug which has been around the longest. One of the primary benefits of methotrexate is that it can be combined with other drugs, including other DMARDs, to provide symptom relief when methotrexate alone isn’t enough. It can also be combined with biologics, which are drugs designed to target specific aspects of the abnormal immune response that cause joint destruction to create a more effective treatment regimen. As a result, doctors can prescribe this drug to patients in a way that allows them to receive a truly customized and personalized treatment plan based specifically on their individual needs (i.e. in the correct dose and combinations), which is the best form of treatment there is. Although methotrexate has been proven as a great treatment option for RA, that isn’t why this drug was created. 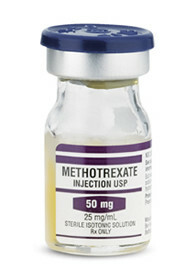 In fact, methotrexate was initially introduced in the 1940s as a cancer treatment drug. Doctors prescribed it to provide relief for patients with different types of cancers, such as non-hodgkin lymphoma and breast cancer. Methotrexate works by interfering with cancer cells’ ability to absorb and use folate. Folate is a form of vitamin B that’s necessary for cell survival, but methotrexate has the effect of partially inhibiting dihydrofolate reductase (an enzyme which plays a critical role in DNA processes) within the cancerous cells. Not only is methotrexate beneficial for people with psoriasis, it’s also helpful for those diagnosed with psoriatic arthritis. This type of arthritis is different than RA in that psoriasis generally precedes issues in the joints. In some cases though, no psoriasis-type symptoms exist at all. Studies some 10 years later discovered methotrexate was also very effective in reducing the inflammation and swelling associated with RA, after its conversion to methotrexate polyglutamate by the body. By the late 1980s, methotrexate received FDA approval for the treatment of patients with RA, which means that doctors could now prescribe it when they felt that it was a suitable treatment for their patient. In fact, today methotrexate is usually a first-line treatment for people with RA, as well as being a drug that is often prescribed for individuals with Crohn’s disease and other serious autoimmune diseases. So what are methotrexate’s possible side effects? The most common negative effects associated with this particular medication are gastrointestinal symptoms like nausea, vomiting, and ulcers (such as with ulcerative stomatitis). Some doctors have also reported that patients have developed mouth sores, fatigue, headache, dizziness, or shortness of breath. It may cause hair loss as well. Though the risk is small, methotrexate therapy can also cause liver damage, so patients who take the medication on a regular basis as a form of RA treatment need to have routine blood tests taken by their doctor to make sure their liver remains healthy. To reduce any further risk of liver damage, patients taking methotrexate should also avoid drinking alcohol. If damage is suspected, your doctor may request a liver biopsy. Ultimately, this can instigate other medical conditions such as anemia, leukopenia, neutropenia, or thrombocytopenia says the UPMC. By limiting the likelihood of bone marrow suppression then, you’re also reducing your risks of these other conditions. Fortunately, routine blood testing by your doctor can identify these potential issues so they can be stopped before they progress. Finally, because methotrexate treatment works by interfering with immune system activity, it can also lower your ability to fight off other infections. For instance, some patients taking methotrexate develop pheumonitis, making a chest x-ray necessary for diagnosis and to set up further treatment remedies. The relatively low dose used in RA means that this risk is reduced, but it’s something you and your doctor need to discuss so you understand exactly how the drug works and what issues to watch out for. Ideally, your goal is to ensure that your dose is low enough to suppress the abnormal activation of your immune system while not doing additional harm to the rest of your body. Taking folic acid may help reduce or even eliminate some of these side effects. 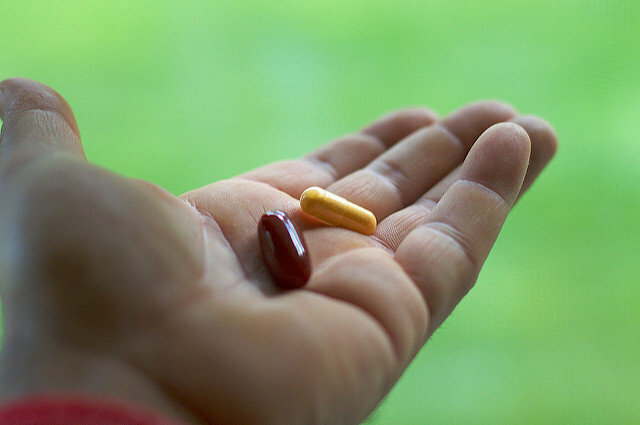 What makes this particular vitamin so important for patients on methotrexate for RA treatment? Though it may not seem like a supplement could do much to ease methotrexate’s potentially uncomfortable side effects, the Arthritis Foundation calls folic acid (a.k.a. vitamin B9) an absolute “must.” This is because it doesn’t interfere with the drug’s positive treatment effects, yet it does ease the angst that some people with RA develop in their gastrointestinal tract when taking this prescribed medication in its normal dose. Additionally, one piece of research published in the journal Arthritis Research & Therapy explains that methotrexate toxicity can become an issue for patients with RA, especially if they take this drug over long periods. Essentially, one of the main problems occurs when it comes time for patients to be taken off methotrexate as withdrawal occurs as much as 50 percent of the time. As a result, some doctors are hesitant to prescribe this drug as a treatment option to patients with RA. However, folic acid reduces this concern for these doctors in that it helps reduce methotrexate toxicity. Even in smaller doses, it has proven to be effective in this regard. There are other ways to reduce toxicity as well, such as by taking additional substances, like calcium folinate for instance. Another study, this one published in The BMJ, a general medicine journal, suggests that taking folic acid in conjunction with the recommended methotrexate dose also helps reduce bone marrow suppression in RA patients without decreasing the effectiveness of the drug’s treatment. This is critical as we’ve already discussed how bone marrow suppression can lead to other health issues and the need for even more treatments beyond those required for RA. Because of its effectiveness and established safety profile, most patients who have RA take methotrexate at some point for treatment, usually by mouth. The typical dose starts at about 5 mg to 10 mg per week. However, in cases where high-dose oral methotrexate treatment is needed, the dose can be increased to about 25 mg per week, or even higher if necessary. For patients in whom treatment based side effects become an issue, the proper dose of methotrexate can also be given as an injection under the skin. Sometimes, simply switching the dose delivery method from an oral methotrexate tablet to a methotrexate injection is enough to help. Splitting the dose into two daily doses instead of one single dose may help as well, or you can ask your doctor about anti-nausea medications. Also, as the University of Michigan reports that “methotrexate stops the growth of rapidly dividing cells, such as embryonic, fetal, and early placenta cells.” No dose of methotrexate is safe during pregnancy. In fact, doctors often use this drug as a treatment for ectopic pregnancy, a potentially dangerous condition which involves a fertilized egg attaching itself to the fallopian tubes versus the uterus, essentially terminating the fetus. As far as folic acid is concerned, doses in the range of 5 to 10 mg per week have been shown to reduce methotrexate toxicity. Folinic acid, a healthy form of folate which doesn’t require any type of enzyme conversion, can also be found in some natural foods. That being said, though folic acid has been proven beneficial in reducing methotrexate’s possible side effects, you should never take any supplement or medication as a form of self-treatment without talking to your doctor first. He or she can help you decide whether it’s the right treatment method for you and, if it is, what dose you need to provide you the greatest relief from methotrexate’s possible side effects without limiting its beneficial effects on your RA. It’s also beneficial to talk to your doctor or pharmacist about the use of any other kind of medications, including over-the-counter pain relievers, just to be on the safe side when methotrexate is your treatment of choice for RA. This is because combining methotrexate with other drugs can lead to additional issues. For example, one study found that, when a doctor prescribed his 57-year-old patient the non-steroidal anti-inflammatory drug (NSAID) etoricoxib in addition to the recommended dose of methotrexate, she developed Steven-Johnson Syndrome -Toxic Epidermal Necrolysis, a condition characterized by lesions and rashes all over her body. So, how do you know if methotrexate is the right RA treatment drug for you? Is Methotrexate Right for You? The reality is that methotrexate can be a very effective treatment option in helping patients reduce the joint damage associated with RA. This, in turn, can reduce pain, improve mobility and function, and increase a patient’s overall quality of life. Thus, many doctors prescribe the typical dose of methotrexate for RA treatment. Despite its long history of safety, many patients still worry about the drug’s negative side effects. This is likely because they’ve heard about the side effects methotrexate can cause in patients with breast cancer or other types of cancer commonly treated by methotrexate. It is important to keep in mind that these particular patients take very, very high doses of methotrexate – much higher than the doses used in RA treatment. Not surprisingly then, their side effects tend to be more prevalent and more severe due to the patient being exposed to higher levels of the drug. To find out if methotrexate is a good choice for helping you manage your RA, talk to your doctor about whether it’s the right treatment for you individually. If you’re prescribed methotrexate, be sure to take it exactly as the doctor prescribes (in the correct doses) for maximum treatment benefits with the lowest risk of side effects. If you’re unsure what that correct dose is or how to take it, your doctor or pharmacist can answer those types of questions for you.